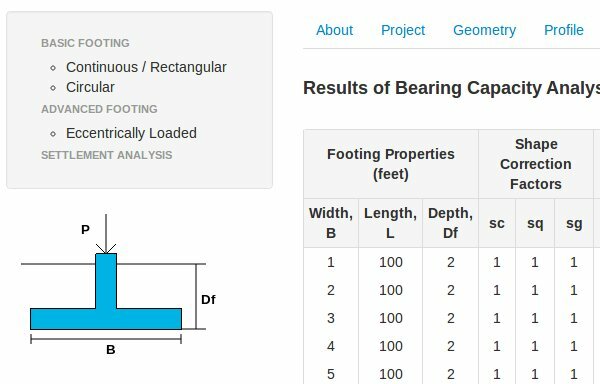 We've been hard at work developing a web app that can aid in analyzing and designing shallow foundations in accordance with the Load and Resistance Factor (LRFD) design methodology. The next area of focus for us is to develop a web app that has the ability to calculate bearing capacity and estimate settlements for shallow foundations in accordance with the Load and Resistance Factor Design (LRFD) methodology and American Association of State Highway and Transportation Officials (AASHTO) procedures. Welcome to the new Geotech-Apps blog! We've been hard at work getting this baby up and running. The reason why it took a bit of time was because we completely created this blog from scratch using Python and Google's App Engine.